The former Ireland midfielder says Martin O’Neill needs to ‘stop moaning’ about the quality of players at his disposal. Andrews speaking on Sky Sports. MORALE IN THE Ireland camp is “rock-bottom” because of Martin O’Neill’s management style, according to Keith Andrews. Pressure continues to mount on the 66-year-old after the Boys in Green lost 1-0 to an under-strength Wales side on a frustrating Tuesday night in Dublin. That result leaves Ireland staring at the very real possibility of finishing bottom of their Nations League group and going into the Euro 2020 qualifying draw as third seeds. 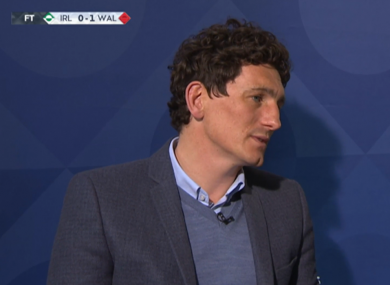 With one win, three draws and five defeats over the past 12 months, ex-midfielder-turned-pundit Andrews has labelled it “one of the worst years in recent memory for Irish football”. “He [O'Neill] has mentioned about technical ability, and look, we do lack in certain areas, there’s no doubt about that,” the pundit said on Sky Sports. “But they [the players] don’t have a clue what they are doing. Andrews added: “He [O'Neill] keeps on going about Robbie Keane, Robbie Keane — leave it. Before Robbie Keane came along top goalscorers got 20 goals in their international careers, that’s where we are, that’s the normal for our country. Robbie Keane was a one-off. You have to stop moaning about what you have and try to create a team spirit, because the more they keep hearing that what’s it going to do for their confidence? You saw the reaction of them at the end, they were on the floor, their morale is rock-bottom at the moment, it’s been one of the worst years in recent memory for Irish football. “A lot of it is down to Martin. There has been a lot of an old-guard shift and players retiring that have made a difference at key areas and key times in games but you have to play the hand you are dealt — there’s no transfer window and you can’t go and buy players. A friendly with Northern Ireland and the final Nations League game (away to Denmark) are next for Ireland, and many have called for the heads of O’Neill and his coaching staff. Having signed two-year contract extensions at the beginning of the year, however, it would cost the association a substantial amount to sack the management team. “Where it is right now is he signed a contract in January and I would be amazed if the hierarchy are happy with that because if they were to change now, it would be too much of an outlay [in compensation],” said Andrews. Email “'It's been one of the worst years in recent memory for Irish football' - Andrews”. Feedback on “'It's been one of the worst years in recent memory for Irish football' - Andrews”.